Under the Microblog category I will be posting snippets of observations and thoughts, as well as connections, inspiring quotations, poetry, photos, and passages. Microblog is a wee jot on the map of my personal blogosphere here in Japan. I invite you to visit often and your comments are always welcome. Thanks to the Internet’s communication web, Barbara and I were reconnected after we lost touch. Throughout all the years that “seas between us braid hae roared” she has kept a poem I wrote, in my original handwriting. By posting it two years ago to a website that listed me, she tracked my whereabouts. Now she plans to visit Japan. Never, for these two Scots. In a funny way the picture Barbara sent you looks like some of the images of deities etc Fiona and I have encountered as we visit a range of temples in Taiwan – it immediately reminded me of the dragons that sit atop or within such temples. Just today we watched an extremely interesting Taoist ceremony culminating in a procession through the streets of Tainan in southern Taiwan. It just goes to show what a small place our world is these days! Allan, hello and thank you. 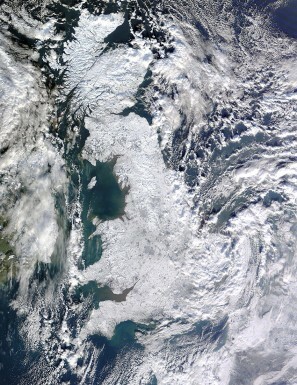 How perceptive of you to recognize dragons in the powerful and rather beautiful satellite picture of the UK whiteout. As you and Fiona have encountered in Taiwan, dragons in Asia are revered as powerful, spiritual symbols and the rulers of seasonal cycles. They are certainly swirling above Scotland now. I am curious, have you had a close-up look at the temple dragons? Chinese dragons are said to have five toes, while Japanese dragons have only three. Someday soon I hope to hear more about the Taoist ceremony you watched. Love to you both from Japan. That photo sure does present us with some thoughts in our head of what it must be like to be under that in an unexpected scenario. I assume it is bringing some people together. All that ice and cold takes some real effort to counter-act. I like your Microblog idea, and the name of it too. It is cool because then you can point out little things, or thoughts on random occurrence that happen, without setting up too much expectation for the theme behind it. The internet sure does reconnect and connect us with people who we are glad for, as long as we seek that. Armen, thank you for stepping into my blog from the cold. As you say, adversity brings some people together. It can also do the opposite. Crisis always reveals true character. Thank you for seconding my Microblog idea – I intend to post moments of awareness as they naturally arise from my lifestyle consciously created in this 300-year-old minka in the mountains. Like you, I very much appreciate the power of the Internet to connect and reconnect, especially when we seek the interaction that resonates with us. So if you feel like it, please visit often. Winter at the foot of Mount Fuji has been glorious so far – my blogosphere in Japan warmly welcomes you.